In the original goods shed in Mariefred you will find our railway café. Here we serve a large variety of homemade bread, sandwiches, cold and warm drinks, and last but not least, ice cream. 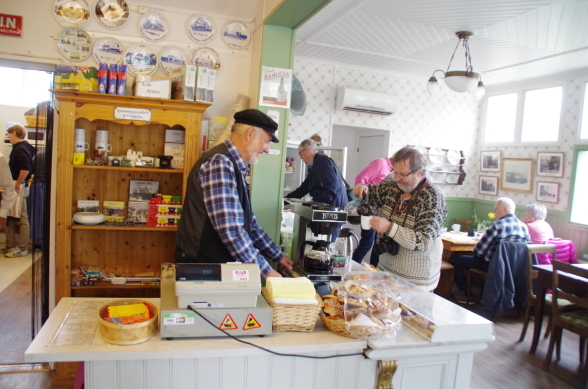 The café is restored to a 19th century vintage look and through our windows or out on the café outdoor seating you can enjoy our glamorus railway atmosphere. For groups (max 25 people indoors), please book beforehand. 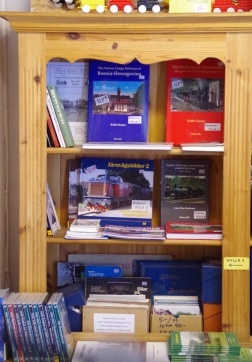 In the railway café you can find an assortment of souvenirs, toys, and books, mainly in the category of railroading, transport history and technology. The café is open every regular trafikday during our season. The show room underwent an extesive audit of the showcase materiel in the year 2016. The show room lies in connection to the railway's café. 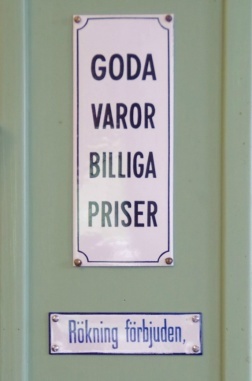 There, you can enjoy the history of swedish 600 mm guage railways and find out the history behind the 7 official passenger railways with the same gauge that we represent. You will also find the history of our society ÖSlJ dating back to 1959, when we started on a railway in connection to Lina factory just outside of Södertälje, through our move to Mariefred in 1965 and on to our present day activities. The show room is very illustrative and well worth a visit. One of many details that give our café its 19th century charm. An example of our collection of books for sale.